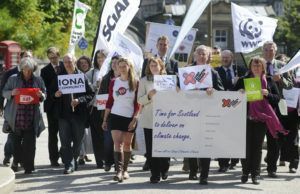 23 senior representatives from Scotland’s largest civil society coalition, Stop Climate Chaos Scotland (SCCS), have today handed a giant postcard to the new Scottish Government urging them to turn manifesto promises into political reality and make action on climate change a priority for the next five years. “Climate change is already having a severe impact on people and nature around the world and it is the responsibility of the next Scottish Government to help reduce that impact by ensuring the fine intentions of our world-leading Climate Change Act translate to a reality. “Our message to the incoming Government, as well as to newly elected and returning MSPs is simple, it’s now time to act on climate change and demonstrate to other countries that it is possible to not only set tough targets, but to deliver on them. : Introduce a new Bill into Parliament to enshrine environmental sustainability and ethical considerations at the heart of public procurement. £100m a year for home energy efficiency: Invest an extra £100 million a year, on top of existing funding, to insulate every home in Scotland, to cut carbon emissions in line with our 42% target by 2020 and end fuel poverty by 2016. 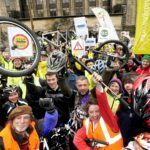 10% of the transport budget for active travel: Dedicate at least 10% of the transport budget to invest in walking and cycling for shorter journeys. Commit £9m per year to a climate adaptation fund: Provide £9m each year as climate finance that will enable poor communities living in developing countries to adapt to and mitigate the effects of climate change.